Now we are to learn of three judges who ruled Israel in turn. Their names were Ibzan, Elon, and Abdon. None of these were men of war, and in their days the land was quiet. But the people of Israel again began to worship idols; and as a punishment God allowed them once more to pass under the power of their enemies. The seventh oppression, which now fell upon Israel, was by far the hardest, the longest and the most widely spread of any, for it was over all the tribes. It came from the Philistines, a strong and warlike people who lived on the west of Israel upon the plain beside the Great Sea. They worshipped an idol called Dagon, which was made in the form of a fish’s head on a man’s body. These people, the Philistines, sent their armies up from the plain beside the sea to the mountains of Israel and overran all the land. They took away from the Israelites all their swords and spears, so that they could not fight; and they robbed their land of all the crops, so that the people suffered for want of food. And as before, the Israelites in their trouble, cried out to the Lord, and the Lord heard their prayer. When a child was given especially to God, or when a man gave himself to some work for God, he was forbidden to drink wine, and as a sign, his hair was left to grow long while the vow or promise to God was upon him. Such a person as this was called a Nazarite, a word which means “one who has a vow”; and Manoah’s child was to be a Nazarite, and under a vow, as long as he lived. The child was born and was named Samson. He grew up to become the strongest man of whom the Bible tells. Samson was no general, like Gideon or Jephthah, to call out his people and lead them in war. He did much to set his people free; but all that he did was by his own strength. When Samson became a young man he went down to Timnath, in the land of the Philistines. There he saw a young Philistine woman whom he loved, and wished to have as his wife. His father and mother were not pleased that he should marry among the enemies of his own people. They did not know that God would make this marriage the means of bringing harm upon the Philistines and of helping the Israelites. As Samson was going down to Timnath to see this young woman, a hungry lion came out of the mountain, roaring against him. Samson seized the lion, and tore him in pieces as easily as another man would have killed a little kid of the goats, and then went on his way. He made his visit and came home, but said nothing to any one about the lion. After a time Samson went again to Timnath for his marriage with the Philistine woman. On his way he stopped to look at the dead lion; and in its body he found a swarm of bees, and honey which they had made. He took some of the honey and ate it as he walked, but told no one of it. At the wedding-feast, which lasted a whole week, there were many Philistine young men, and they amused each other with questions and riddles. By his “heifer,”which is a young cow,of course Samson meant his wife. Then Samson was required to give them thirty suits of clothing. He went out among the Philistines, killed the first thirty men whom he found, took off their clothes, and gave them to the guests at the feast. But all this made Samson very angry. He left his wife and went home to his father’s house. Then the parents of his wife gave her to another man. But Samson would not take his wife’s sister. He went out very angry; determined to do harm to the Philistines, because they had cheated him. He caught all the wild foxes that he could find, until he had three hundred of them. Then he tied them together in pairs, by their tails; and between each pair of foxes he tied to their tails a piece of dry wood which he set on fire. These foxes with firebrands on their tails he turned loose among the fields of the Philistines when the grain was ripe. They ran wildly over the fields, set the grain on fire, and burned it; and with the grain the olive trees in the fields. The Philistines looked on Samson’s father-in-law as the cause of their loss; and they came and set his home on fire, and burned the man and his daughter whom Samson had married. Then Samson came down again, and alone fought a company of Philistines, and killed them all, as a punishment for burning his wife. 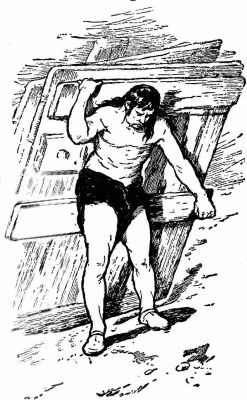 After this Samson went to live in a hollow place in a split rock, called the rock of Etam. The Philistines came up in a great army, and overran the fields in the tribe-land of Judah. After this Samson went down to the chief city of the Philistines, which was named Gaza. It was a large city; and like all large cities, was surrounded with a high wall. When the men of Gaza found Samson in their city, they shut the gates, thinking that they could now hold him as a prisoner. But in the night Samson rose up, went to the gates, pulled their posts out of the ground, and put the gates with their posts upon his shoulder. He carried off the gates of the city and left them on the top of a hill not far from the city of Hebron. And Samson rose up and broke the twigs as easily as if they had been charred in the fire, and went away with ease. Then, while he was asleep, she wove his hair in the loom, and fastened it with a large pin to the weaving-frame. But when he awoke, he rose up, and carried away the pin and the beam of the weaving-frame; for he was as strong as before. Then while the Philistines were watching outside, Delilah let Samson go to sleep, with his head upon her knees. While he was sound asleep, they took a razor and shaved off all his hair. Then she called out as at other times. He awoke, and rose up, expecting to find himself strong as before; for he did not at first know that his long hair had been cut off. But the vow to the Lord was broken, and the Lord had left him. He was now as weak as other men, and helpless in the hands of his enemies. The Philistines easily made him their prisoner; and that he might never do them more harm, they put out his eyes. Then they chained him with fetters, and sent him to prison at Gaza. 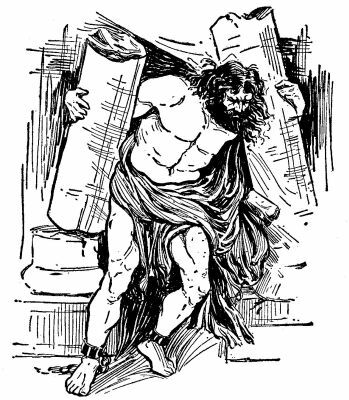 And in the prison they made Samson turn a heavy millstone to grind grain, just as though he were a beast of burden. But while Samson was in prison, his hair grew long again; and with his hair his strength came back to him; for Samson renewed his vow to the Lord. And he bowed forward with all his might, and pulled the pillars over with him, bringing down the roof and all upon it upon those that were under it. Samson himself was among the dead; but in his death he killed more of the Philistines than he had killed during his life. Then in the terror which came upon the Philistines the men of Samson’s tribe came down and found his dead body, and buried it in their own land. After that it was years before the Philistines tried again to rule over the Israelites. Samson did much to set his people free; but he might have done much more, if he had led his people, instead of trusting alone to his own strength; and if he had lived more earnestly, and not done his deeds as though he was playing pranks. There were deep faults in Samson, but at the end he sought God’s help, and found it, and God used Samson to set his people free.